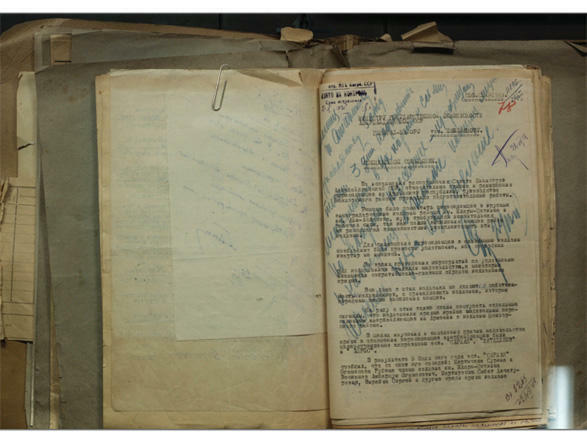 The State Security Service declassified some of the materials stored in its archives. By signing the Treaty of Gulistan in 1813 and the Treaty of Turkmenchay in 1828, the division of Azerbaijan’s historical lands wasn’t completed. On the contrary, the process of exclusion of the Azerbaijani territories by force under the patronage and direct participation of enemy forces became systematic and continued. The process of purposeful resettlement of Armenians living in many neighboring countries to Azerbaijani lands began. A separatist administrative territorial division under the name “Armenian region” emerged on the historical lands of Azerbaijan. Then the propaganda of the dream of “Greater Armenia” began, and for this purpose various Armenian organizations based on fear and terror emerged. Thus, the foundation of a more insidious and purposeful policy of the Armenian-Dashnak forces to eliminate the Azerbaijani people and seize its lands started. The ideology of terrorism and fascism became an integral part of state policy in Armenia. This ideology is the basis of territorial claims to neighboring states, the policy of ethnic cleansing against Azerbaijanis, Turkic and other peoples. The Armenian terrorist Dashnak forces used the dirtiest methods all the time to achieve their insidious goals, and even couldn’t restrain themselves from opposing the tsarist and Soviet Russia, which sheltered them and allowed them to move to the historical lands of Azerbaijan. When examining the weighty evidence of the atrocities committed by Armenian executioners as part of fascist military formations during the Second World War, the consequences of these atrocities are terrifying. Today in Armenia, no matter which forces came to power, chauvinism, extremism, military violence, annexation are always propagated and encouraged in the most extreme form, the younger generation is being brought up in the spirit of hatred and intolerance towards neighboring nations, and is being inculcated with a “heroic” image of Armenians who committed crimes against humanity. Azerbaijan’s State Security Service, in the course of researching documentary materials stored in the archives, found numerous factual confirmations of the brutal actions of the Armenian terrorist Dashnak forces, including the Dashnaktsutyun party, which bears the ideology of terrorism, as well as Armenians who were particularly cruel against humanity during the Second World War. Given the scientific and historical significance of materials from the point of view of protecting the world from terror and the consequences of fascism, the urgency of informing the international community about the results of the policy of annexation and political aggression being pursued by Armenia against Azerbaijan, the need to refer to primary sources in exposing this policy, the State Security Service found it expedient to declassify some of the materials and make them available to the general public.